SACRAMENTO, CA – April 13, 2017 – California Assemblywoman Catharine Baker, who serves as vice chair of the state Assembly Higher Education Committee, will be the keynote speaker at the April 23 Northern California commencement ceremony for National University, which is among the largest private, nonprofit universities in California. Entering her second term as a member of the California State Assembly, Assemblywoman Baker has set a precedent in identifying effective solutions in the education landscape by working to improve K-12 education, supporting and empowering California teachers and assisting the military community in achieving education and career goals as they transition to civilian life. Assemblywoman Baker has a personal understanding of the National University experience, with memories of working on homework at one of the University’s campuses when her mother attended programs at the campus. While attending the University of Chicago, Assemblywoman Baker overcame cancer and earned her Bachelor of Arts degree, graduating with honors as a member of Phi Beta Kappa. She went on to earn her law degree from UC Berkeley and worked as an attorney advising small businesses and nonprofits before being elected to the Assembly in 2014. Today, as a working mom raising school-age twins, Assemblywoman Baker is balancing her family and career with service to the community. 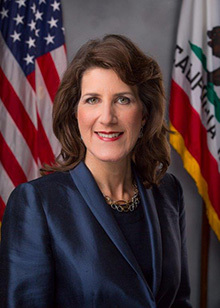 Assemblywoman Baker represents California’s 16th Assembly District, which comprises Pleasanton, Livermore, Dublin, Walnut Creek, Danville and San Ramon, among other East Bay communities. She had the most bipartisan record of any Assembly member in the 2015-16 session, according to an analysis by the Sacramento Bee. “Assemblywoman Baker exemplifies the highest standards for leadership in public service and embodies the attributes of empowerment, dedication and compassion that serve as a benchmark for our graduates.” said Dr. David Andrews, president of National University. Similar to Assemblywoman Baker’s areas of focus, National University has a strong tradition in education, as well as serving the nation’s military and veteran population. About a quarter of the University’s student population is from the military community, and the Center of Excellence for Veteran Student Success is dedicated to supporting these students in their transition to campus and civilian life. In addition, the National University Sanford College of Education recommends more teachers for credentials than any other university in California and is leading the national expansion of the PreK-6 Sanford Harmony and PreK-12 Sanford Inspire programs, which provide teacher support and strengthen student development. National University’s Southern California commencement ceremony is set for June 17 at San Diego’s Petco Park.